As it will be summer soon (I cannot wait for it to be warm again), I took some summer sandals and flats out of their dust bags and made them ready-to-wear any time, the sun starts showing itself again. While I was sorting out my shoes, I discovered that I have barely worn some of the shoes (when did I buy those?) and some of them were worn almost the whole summer (totally worn out and ready for the dumpster). Obviously, Spring cleaning was a bit long overdue. I also realized that I have barely shown my shoes on my blog, so I will start with my Melissa shoes collection. Once, there was a big sale at the Bijenkorf department store and I was able to purchase Melissa shoes for a discounted price. It was still a big splurge, but since it was around Christmas and my birthday, I allowed myself to get them. I wanted to be able to wear the Melissa shoes year round, so I bought airy flats, a pair of fancy high heels, and a pair of rubber rain boots, which is perfect for the rainy days in the Netherlands. I have given a small peek of these shoes in this blog post, but I will now show you some better pictures and my thoughts after wearing them longer. The Melissa + Campana zig zag flats are really comfortable to walk on. I could walk for hours without pain, but the front tip of the shoes is a bit narrow and the shoes do not attach to the foot well enough. Every step I take, I feel like it will come off and every once in a while, it really does. It might be different if I got a smaller size, but I think size 38 would be a bit too small for me, when you consider that the front part is a bit narrow. A size 38.5 might work, but in my country, they don't sell half sizes in shoes. Still, the beautiful golden sparkles of the shoes makes me want to wear them often under the shiny sun. The slight discomfort of "the shoes continuously coming off" part, I can deal with. I don't really wear high heels a lot, but I just fell for the beautiful, glitter wings in the back. The shape of the high heels looks a bit weird though. It kind of looks like the shoes that Daisy Duck wears, but if it makes it more comfortable, I am fine with that. I read online that it falls a bit small, so I sized up. It was a good idea, since it fits me perfectly. I have never worn it for a long time, but it forms itself to the shape of my feet well and it didn't hurt a lot during the short periods, I have worn it. I discovered that there are also other versions of this pair of shoes. The Vivienne Westwood + Melissa matte black classic heel with a glossy wing in the front, looks gorgeous. It has the court shoe shape that I want. After searching my whole life, I still don't own a pair that is comfortable. The Vivienne Westwood + Melissa Lady Dragon on the other hand, has a slightly wide slingback strap in the back and a peep toe in the front. Attached to the front part, there is a version with a glossy wing and one with a matte heart+wing decoration. 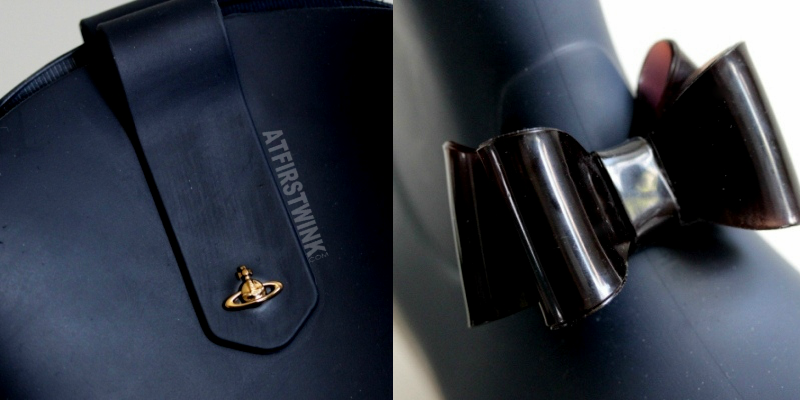 This is officially, the first item I own that is designed by Vivienne Westwood, a designer I greatly admire. It rains a lot in the Netherlands, so I have worn this pair of boots the most out of the three. It is also the most comfortable pair. I have worn these for hours without pain and it never got sweaty or moist inside, even during a heavy downpour. The only thing is that after wearing it for more than a year or so, it now feels like the heel on the left boot is a bit detached and coming off/moving, but you can't see anything of that on the outside. It seems to be still okay and not too uncomfortable for me, so I will keep wearing them. I really like the cowboy boots shape and the small little details. The bows in the front looked a bit unusual to me at first, but after a while, I got used to it and I now find that it adds a bit of quirkiness to it. It fits my personality perfectly.